I’m in the process of trying to close escrow on a house. But it has not been easy. While getting our loan, we found out So Cal Edison had mistakenly opened a claim against us for a bill we had actually paid. This happened almost a year ago, but we didn’t find out until this last month. I called So Cal Edison and they agreed that a mistake had been made, but that there was nothing they could do. They advised I call the collection agency to clear it up. I called the collection agency, and they informed me that, unfortunately, there was nothing they could do, and advised I call So Cal Edison to clear it up. It took a week of kind, harsh, understanding, and irate calls and hours on hold to finally resolve the situation. After several hours on hold, Mr. Smith finally informed me that, while the IRS had received, processed, and cashed the check we sent, they had accidentally misplaced our tax return. On behalf of the IRS, Mr. Smith was very sorry, but informed me there was nothing he could do to correct this mistake, as there was no protocol to handle these sorts of situations (which happen more often than you’d think, he told me). My best bet was to send them everything again (sans the check), and wait (and hope) for the trusted IRS to process everything correctly this time. Through this (and many other unforeseen issues), it became apparent: the devil was trying to prevent us from closing escrow. God must really want us to buy this house. … My best bet was to send them everything again (sans the check), and wait (and hope) for the trusted IRS to process everything correctly this time. Through this (and many other unforeseen issues), it became apparent: God was trying to prevent us from closing escrow. God must really want us to NOT buy this house. In the bible, Gideon wasn’t sure if God would save Israel. So he decided to look for a sign: he would leave a cloth out on the ground, and if the cloth was wet in the morning, Gideon would know that God would save them. Morning came, and the cloth was wet. But then Gideon realized, “This could just be a coincidence.” So he decided: he would leave a cloth out on the ground, and if the cloth was dry in the morning, Gideon would know that God would save them. Morning came, and the cloth was dry. At this point, Gideon stopped asking for signs, and believed what God had actually said a few verses earlier: “Go in this might of yours, and you shall save Israel from the hand of the Midianites. Have I not sent you? Surely I will be with you, and you shall defeat the Midianites as one man” (Judges 6:14, 16). My point is this: God doesn’t lead through circumstance. If He doesn’t want you to do something, He’s not going to send the IRS after you; He’ll just say, “Hey, don’t do that” (Acts 13:2). Better yet, chances are He has already told you what you should and shouldn’t do in scripture. So rather than make your decisions based on esoteric signs and circumstances that could be interpreted in any number of ways, make your decisions the way God intended: based on the revealed Word of God and the leading of the Holy Spirit. Anything else is just chance. Precipitation – condensed water vapor falls to the earth’s surface, mostly in the form of rain. Runoff – the variety of ways by which water moves across the land as it flows into lakes, reservoirs, or the ocean. Evaporation – the transformation of water from liquid to gas phases as it moves from bodies of water into the overlying atmosphere. Of course, the bible isn’t merely talking about precipitation here. The rain we are asking God to shower down upon us is the Holy Spirit, in all His glory and power and awesomeness. We are told to pray for a move of the Spirit to sweep through our barren land and give us desperately needed revival. 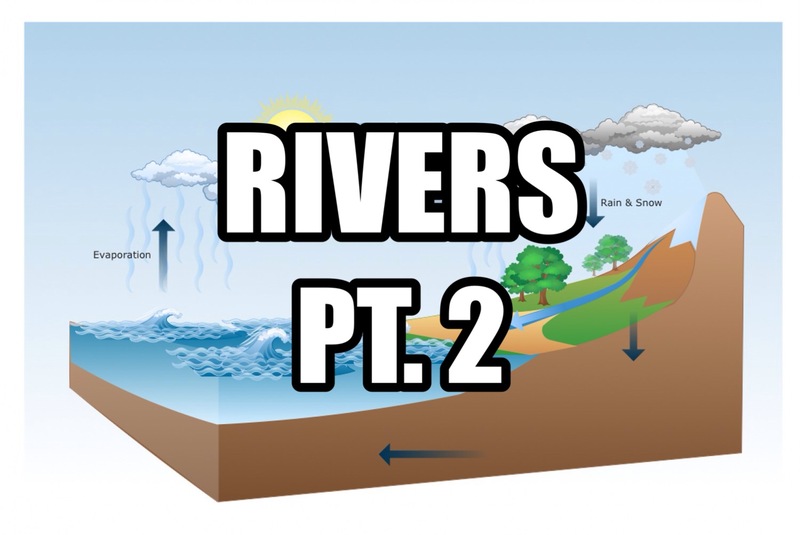 We’ll skip step two for a moment, and move right along to Step Three of the water cycle, which is evaporation. Once the water has been collected in large bodies of water, it can finally make the journey from the earth to the heavens. If that’s not a blatant metaphor for salvation, I don’t know what is. Throughout the bible, bodies of water are often mentioned symbolically to represent large groups of people. And once the rains of the Holy Spirit reach the people, multitudes will be swept into the Kingdom of Heaven. And finally, what was that second step? What bridges the gap between the rain falling from the clouds and evaporating back into the sky? What brings the Holy Spirit to the people? Rivers are pivotal to the entire process, acting as conduits to transport rainwater through the barren lands to the oceans and lakes, so it can return back into the heavens. And you are pivotal to the salvation of everyone around you, acting as an ambassador of heaven who speaks life into this dying generation, so that the lost would be swept into God’s kingdom. Never underestimate the calling on your life. Never forget the power of the Holy Spirit that flows through your hands and feet. Out of your heart flow rivers of living water. And without you, our world is headed for a drought. It’s an interesting metaphor, really. My pastor began a series on the Holy Spirit yesterday morning. He read John 7, and as he talked about the “rivers of living water,” I was reminded of the three laws of geography my cousin taught me several years ago. Law #1: I don’t actually remember the first law. Law #2: Mountains want to be flat. 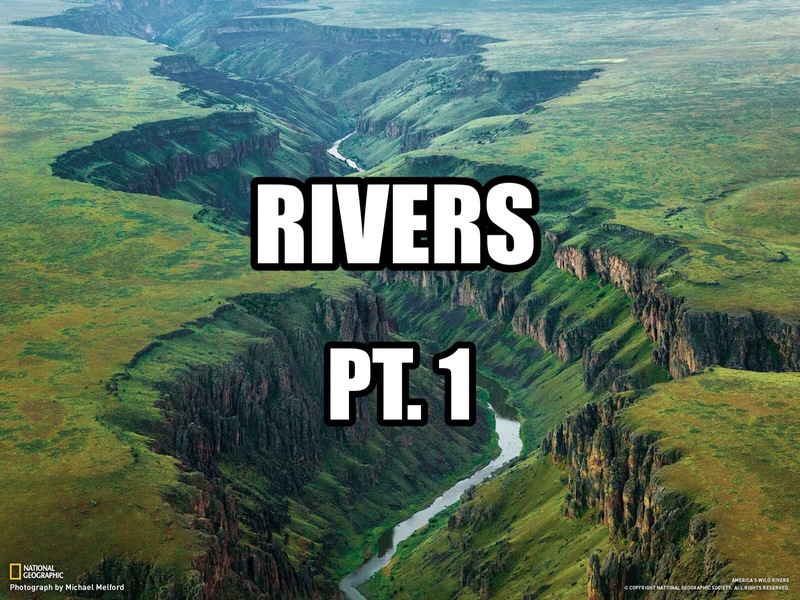 Law #3: Rivers want to be straight. Rivers can tend to be quite windy, but over the course of time they gradually erode the surrounding land and straighten themselves out. Basically, rivers shape the environment around them. They’re supposed to, anyway. Think about that for a second. Rivers can carve their way through nature. They tear their way down mountains. They cut out valleys. They transform land, they transform cities, they transform societies, they transform the world. And Jesus said when you allow the Holy Spirit to flow out of your life, it’s comparable to these world-changing rivers. I bet when Jesus invented rivers ages and ages ago, He knew He’d one day preach a sermon to a group of uneducated fishermen about the incredible power of the Holy Spirit. And He probably programmed things like erosion into them to demonstrate the sheer magnitude of His intentions for the Spirit-empowered church. We are supposed to transform society. We are supposed to change culture. We are supposed to have an impact on the world as we know it. As Jesus said, we are supposed to disciple entire nations. And Jesus told us exactly how to do it. His disciples were filled with the Holy Ghost, and they allowed the violent torrents of the Spirit to flow out of their hearts and turn the world upside down. And we have been commissioned to do the same exact thing. So get going. Let God’s words pour from your lips. Let His power gush from your hands. Let His life flow from your very being. It’ll change the world. There’s no way it won’t.